Blue Lagoons Are A Passé, Pink Ones Are Here To Leave You Jaw-Dropped! Who knew Mother Nature could be so dope! As kids, we were always told to use the blue crayon when it comes to coloring the water body. We guess it’s about time teachers started thrusting a pink crayon in the kids’ hands to tell them that lakes and lagoons do exist in the color ‘pink’. Yes, Mother Nature can play a googly on us sometime and give us jaw-dropping dope sceneries to gape at. The pink lakes, for example, look straight out of the fairy tale books and leave us wanting to make a visit ASAP. For those of you logicians out there trying to understand this natural phenomenon, there are various reasons, depending from lake to lake, that could turn it into pink. For example, Lake Hiller in Australia gets its color from the "salt-loving bacteria" and Dunaliella algae that are found in the water. These organisms are in itself red and pink in color which paints the lake, pink! Most of these lakes are sprawled across the world and tucked away in the most beautiful corners. We suggest you add these strawberry-fondue-like lakes in your travel bucket list! Bringing you the list and the pictures of these lakes that will make you want to go like right now! Situated in West Australia, the 600-meter lake is right next to the Pacific ocean. If you're blessed enough to have a view from atop, you will be able to see the pink of the lake and the blue of the ocean in the same sight. Fascinating, ain't it? Somebody, please page the lipstick companies to take note of this shade for lipsticks! According to the National Geographic, the lake gets its color from the water that runs off the multi-colored rocks in the vicinity. We are so not complaining! This lake is used for farming salt. In fact, the rock lie structures that you can see are actually made of salt. However, to reach this spot, you have done a bit of a trekking. But we think it absolutely worth it! We swear by the sight of this one! To add to the beauty are the flamingoes that come by this lake every now and then. According to The Culture Trip, this lake too is used for salt farming which is why there isn't much of vegetation. But the pink hues still make it a must-visit. This serene lake is located in Senegal. This one is at its prime pink during the dry seasons viz. June and November. So plan this one accordingly! 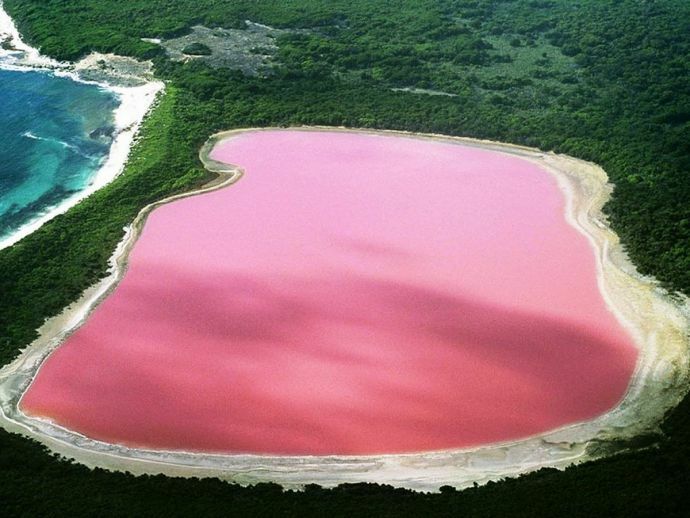 Australia is the home to another pink lake called 'Hutt Lagoon' in the Coral Coast area. This lake gets its color from the algae present in the water. Also, the hue varies with every season and it can even turn into lilac purple sometimes. I mean, we can't even! Just added a new blog post with the photos from this beautiful laguna! Okay, this one is not exactly pink, but more like reddish-orange. Nonetheless, fascinating! The lake is situated 10,000 feet above sea level and attracts a peculiar specie of flamingoes towards it. Major wants!